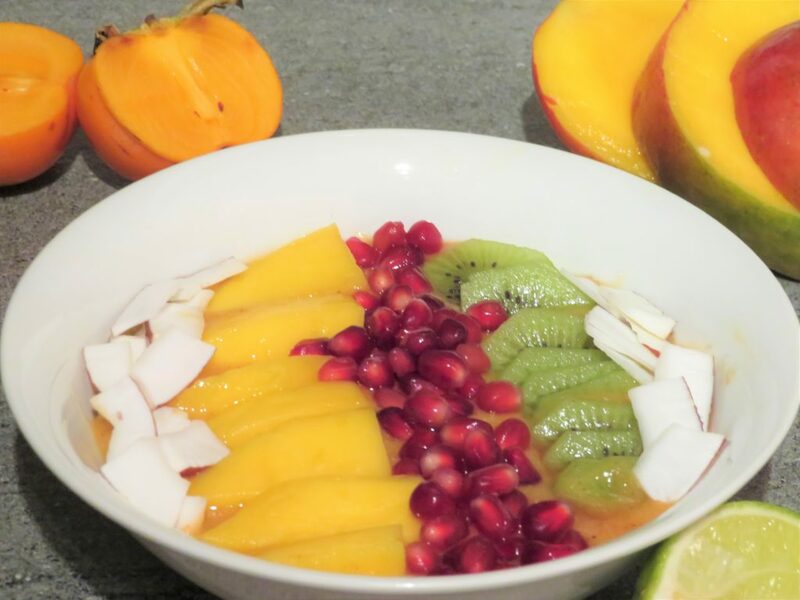 This bowl of sunshine is going to brighten up your morning and packed with vitamins it will give you’re your immune system a boost. 1 Put all the ingredients for the smoothie into a blender/smoothie maker and whiz until it is smooth. 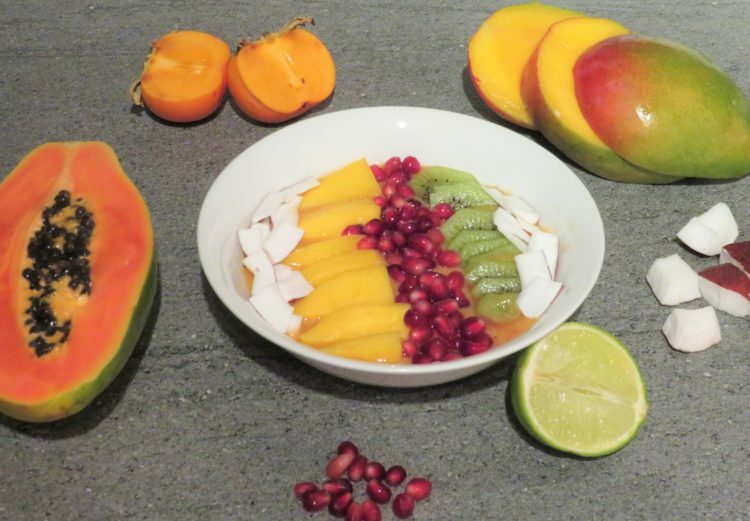 2 Pour the smoothie into a bowl, add the toppings and enjoy! Mangos are rich in ploy-phenolic anti-oxidant that protect against colon, breast, leukaemia and prostate cancer. It is great source of vitamin-A, beta-carotene, potassium, vitamin B-6, Vitamin-C, vitamin-E, copper and dietary fibre. It also improves complexion and has anti-aging benefits. Papaya is very low in calories and a good source of dietary fibre, which helps to reduce constipation. It also helps with muscle tissue repair, ease menstrual pain, aids weight loss, treats gout, helps keeps clear skin and stimulates hair growth. It has one the highest amounts of vitamin-C found in fruit it is a good source of vitamin-A, B-complex vitamins, potassium and calcium. Sharon fruit have anti-infective, anti-inflammatory and anti-oxidant properties. It also contains Vitamin-C, B-complex vitamins, potassium, manganese, copper, phosphorus and zinc. Pomegranate is a good source of soluble and insoluble dietary fibre which aids digestion and bowel movements. It aids weight loss, reduces cholesterol, boosts immunity improves circulation and protects from cancer. It all has vitamin-C, vitamin B-5, vitamin-K, calcium, copper, potassium and manganese.